Like its protagonist Chibiterasu, Okamiden is just as lovely as the original ... only, y'know, smaller. It's no secret that we at The Escapist are really excited about Okamiden, the scaled-down sequel to the incredibly lovely Okami. The brushstroke gameplay seemed like a natural fit for the DS stylus, and Chibiterasu is almost painfully adorable. From what I've played so far, our enthusiasm was well placed: Okamiden is a beautiful game that controls perfectly and maintains the ethereal aesthetic that made the first one so special. Because you're just a pup, you're not as strong as a grownup goddess, but you'll meet plenty of helpers during your adventures. Your partner will ride on your back for fast travel and will also help you in a fight, but they're most useful when it comes to solving puzzles. One of the new brush techniques is Guidance, which lets you draw a path for your partner and lead them to a specific spot, such as a switch. Your partners are also children, so you'll have to work together to overcome obstacles, but you'll discover strengths you never knew you had as the game progresses. Dropping into brush mode is extremely easy; simply hit one of the shoulder buttons, then use the stylus to draw what you need on the touch screen. Precise brush strokes were sometimes difficult to pull off using the PS2's thumbsticks, but the DS stylus makes it incredibly simple to trace specific shapes and designs. I really appreciated it whenever I used the Rejuvenation technique, which requires you to trace the outline of a missing area to recreate what should be there. The Bloom technique, which restores dead trees, is important for increasing Chibiterasu's happiness, which helps her become stronger. I only got to sample a small portion of combat, which consisted of hitting the Y button to throw out my Sun Shield while trying to evade enemies, but it worked well. Unfortunately, I couldn't hear any of the music. Perhaps what's most important is that the sumi-e art style that made Okami so beautiful and distinctive has been maintained perfectly in Okamiden. It feels like a genuine successor to the franchise, making the most of its diminutive status. 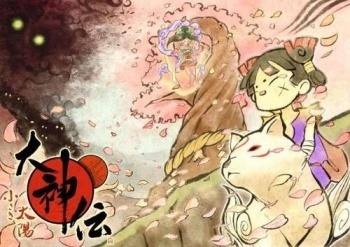 Okamiden is scheduled for release in 2011.